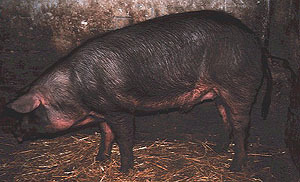 The Mora Romagnola is an indigenous pig breed of the Ravenna province (Emilia Romagna, Italy); and it is unknown if it was ever exported to other parts of Europe. There are now only 18 animals surviving in one herd near Faenza (Ravenna) , while in 1949 there had been more than 22.000. The Mora Romagnola has a typical long body, the head is long with straight profile and forward-growing ears that cover a long, tapering snout. The average height is 80 cm (sows are taller than boars) with an average mature weight of 250-300 kg. Nowadays the sows are not very prolific (5-6 piglets for primiparours and 9 for multiparous) and have a poor supply of milk for their litters. The name "Mora" ("blackberry", or "mulberry" or "moor") was adopted in 1942 in reference to its coloring, very dark brown with a coppery hue; sows have a thicker ridge of longer bristles along the back and the skin is dark grey, with a rosy color underside. The young have hair of a fulvous color, which becomes darker as they grow. There were several varieties at one time; the widespread "Forlivese", the light red "Faentina" and the darker "Riminese". Until mid ’50’s all varieties were crossed with local inbred strains of Large White (the "San Lazzaro" and "Bastianella"); the hybrid offspring was known as "Fumati" (smoky). Like most old-fashioned breeds, the Mora is quite prone to becoming fat, it is a late developer but it is vigorous and well adapted to outdoor systems of management being an excellent grazer. The Dipartimento di Scienze Zootecniche of the Università di Torino (Italy) and WWF Italy have recently started an attempt to conserve the Mora Romagnola. Three sows and one boar have been bought near Faenza (Ravenna) from the owner of the last herd, Mr. Mario Lazzari. Our initial program consists of two steps: 1) a collection of data, books, articles, pictures and other news about the Mora Romagnola; 2) the search of other animals through the world (pure or crossbreds). If you have any information please contact us at the following address.